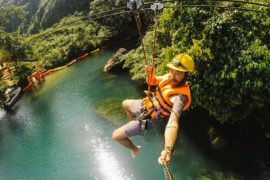 Our La Ken Jungle Challenge is a tour designed for those intrigued by these elements of nature, with fewer cave jaunts than our traditional tours. 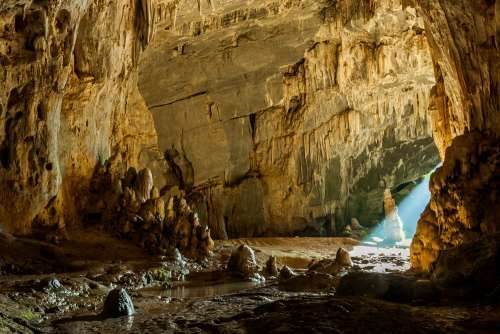 You’ll still get a dose of the must-see underground world with 2 dry caves and 1 river cave explored throughout the duration of the challenge. 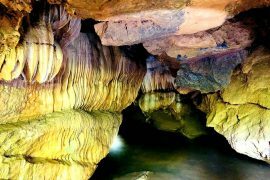 The first day will include the majority of cave visits and day two will up the difficulty level with a strenuous jungle trek, with a short but thrilling cave swim as well. The tour finishes with time spent in a local village where you’ll have the chance to fall in love with countryside culture. DEPARTURE/RETURN LOCATION Dong Hoi, Phong Nha, Ho Chi Minh Trail, Tan, La Ken, Hung Dung Valley, Hung Nhai, Yen Tho Dam, Tan Hoa. DEPARTURE TIME Pickup time from 7h30 am to 8h00 am in Phong Nha. 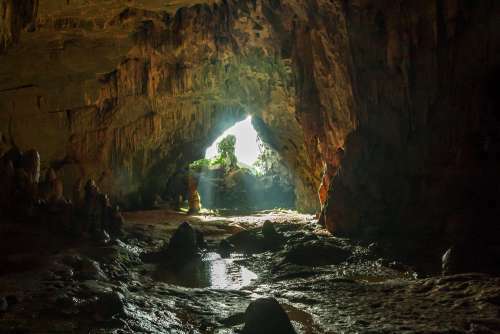 The first day begins with a round pickup from any local hotel within Phong Nha, and then you’ll head to our Tan Hoa base, where your safety briefing will take place. After your tour guide has reviewed your itinerary, trekking rules, and safety measures, you’ll have a few minutes to prepare and pack up for your adventure. 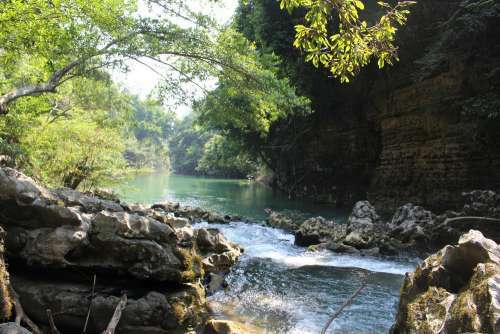 Around 10 am, the group will set off from headquarters across the rolling landscape of peanut and corn fields, backdropped by limestone mountains all around. 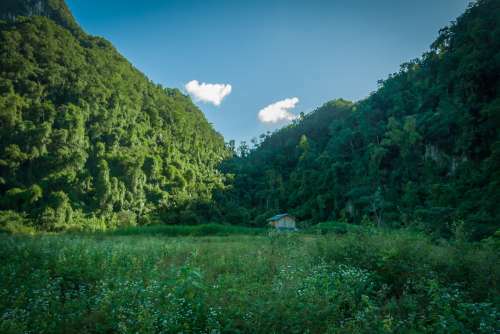 After short crossing of the Rao Nan river (depth will depend on time of year and season), the tour escalates with a climb up the hill and across a brushy field to Rat Cave. 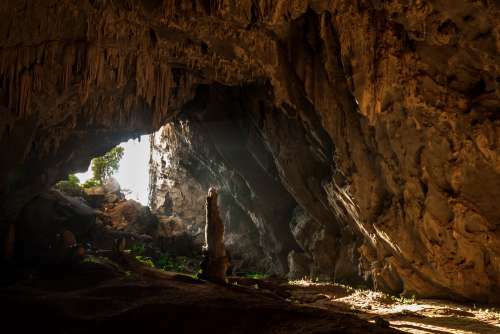 From Rat Cave, you’ll come out into La Ken Valley, where you’ll find a jungle teeming with different plant life. 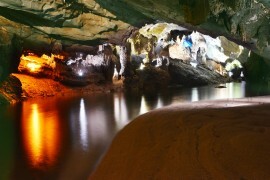 After making your way through La Ken Valley, you’ll be greeted with the sight of Gibbon Cave. This cave is quite big with a beautiful entrance. There is a small deep pool about 150m inside from the entrance. Some paths through the cave are small and you will have to squeeze and crawl to make your way through. 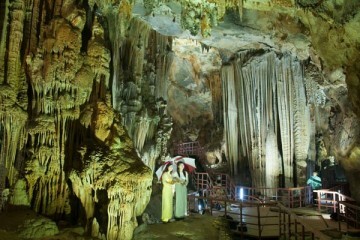 At the end of the cave, the ground is soft from the mixture of soil and limestone powder. With an abundance of cave pearls around, this cave is great for those who like photography. 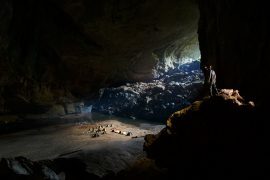 From Gibbon Cave, it’s time to head to camp, which will be set up at Hung Dung Valley. You’ll enjoy a dinner made from scratch by the chef of your porter team, and fall asleep amidst the wild beauty of nature. The second day begins with breakfast and then a journey from Dung Valley, where camp is located, to Hang Doi. 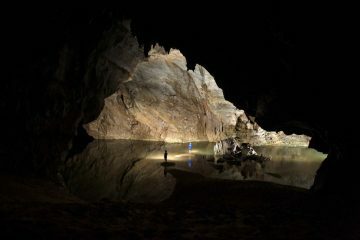 In this cave, a short swim will await you through the dark. Jumping into the water is a sure way to wake you up if you didn’t have enough coffee at breakfast! 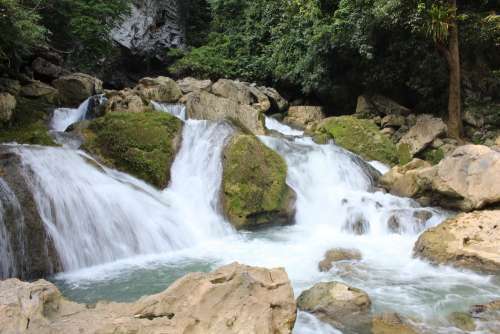 Following Hang Doi, you’ll be able to stop and enjoy a swim at the waterfall which flows at the exit of the cave. There may be several waterfalls along the trail this day. Their intensity will depend on what season you are visiting us in, but they are sure to amaze you regardless. 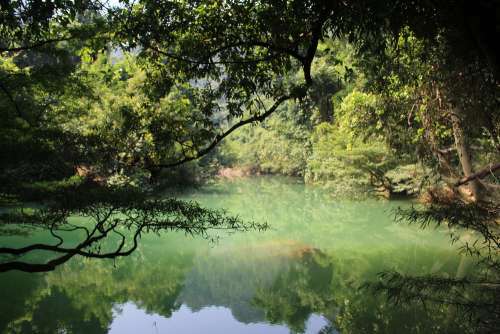 After swimming, the group will proceed from Hang Doi, leave the river, and climb up through the forest a couple of hours to the top of the dam. 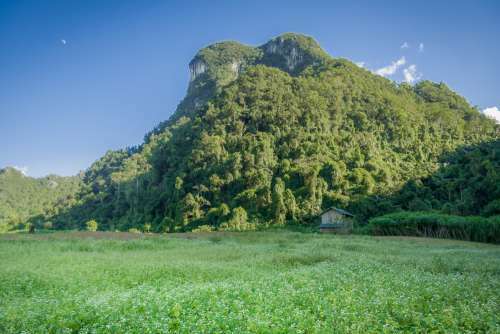 You’ll stay along this high route and then trek down into the rice fields of Tan Hoa Valley. Arrive back to the office around 3:30 – 4:00 pm. 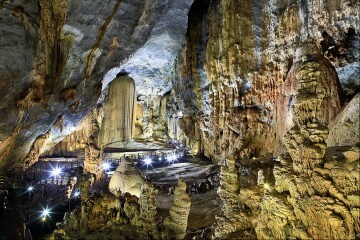 Your tour will finish back in Phong Nha between 5:00 – 5:30 pm.